CENN’s Green Center in Bulachauri has been hosting eco-camps every summer since 2010. The camps were divided into 5 groups and were conducted from June 27 to September 5, 2016, and hosted high school students from public and private schools throughout Georgia. This year, the syllabus of the camps included various environmental topics including forest ecosystems and their sustainable management, appreciating the difference among various plants, biodiversity conservation, integrated waste management and steps taken by Georgia in that area, the impact of mining on natural and socio-economic environment of Georgia, urbanization and trends in urban development, natural risk reduction and management possibilities, climate change and the consequences related to its risks, climate-smart agriculture and pasture management. In addition to topic-based, environmental lectures, the participants were given an opportunity to learn the specifics of working on a journalist text, working on a literary text, main trends of use of social media and the specifics of landscape photo shooting. The youth will use the received skills to continue actively using GreenWatch application and sharing their green activities with their peers using social media. Giorgi Avazashvili, a participant of one of the groups even created a video blog about the new friends he made, fun hiking tours and interesting seminars that he experienced. Hiking tours made the final part of the camps. This summer, various groups took different trails to study local endemics and conducted environmental monitoring under leaders’ supervision. 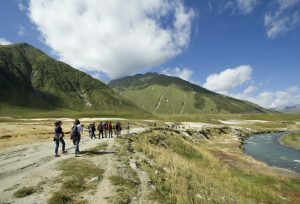 The participants passed Tsilkani, Mukhrani, Tezi, Mleta and Lomisa, Truso Valley, Kazbegi and Kintrishi protected areas as well as Shatili and Mutso. Prior to taking off, the participants had a preparatory seminar where they learned from professional instructors about the rules of conduct and the purpose and use of hiking equipment. In parallel with eco-camps, a competition for Niko Ketskhoveli school award is in progress where youths from various schools of Georgia will compete with one another and the above award will be granted to the winner. Camp participants were given detailed instructions about the rules of the competition so that they can spread information in their respective schools and take part in the competition. The main goal of eco-camps is to prepare future generations for tackling environmental challenges. Here in CENN, we believe that a change is only possible when one is ready for it. All of us, no matter the age, gender, social status or beliefs need to make our contribution. Organising a camp is a great challenge and responsibility for our team, though the results continue to exceed our expectations from year to year. CENN eco-camps will continue and offer opportunities to participate in any school student involved in the competitions and activities organised by our organisation throughout the year. In 2016, conducting camps at CENN’s Green Center in Bulachauri was possible within the project “Sustainable Forest Governance in Georgia” supported by Austrian Development Cooperation and the Government of Abkhazia.